Like many other carnival the origin is associated with the arrival of spring, but the story about the costumes which main component is a wooden mask and a large sheepskin jacket is another. The legend says that after the Hungarian army had been defeated by the Turks the people of Mohacs attacked the Turks dressed in this costumes. The Turks fled as they thought they were attacked by devils. The legend says that after the Hungarian army had been defeated by the Turks the people of Mohacs attacked the Turks dressed in this costumes. The Turks fled as they thought they were attacked by devils. Masquerades, music and dance performances, gastro events and handicraft fairs are all part of the festivities, but the main attraction remains the parade of the Busós' on Carnival Sunday. 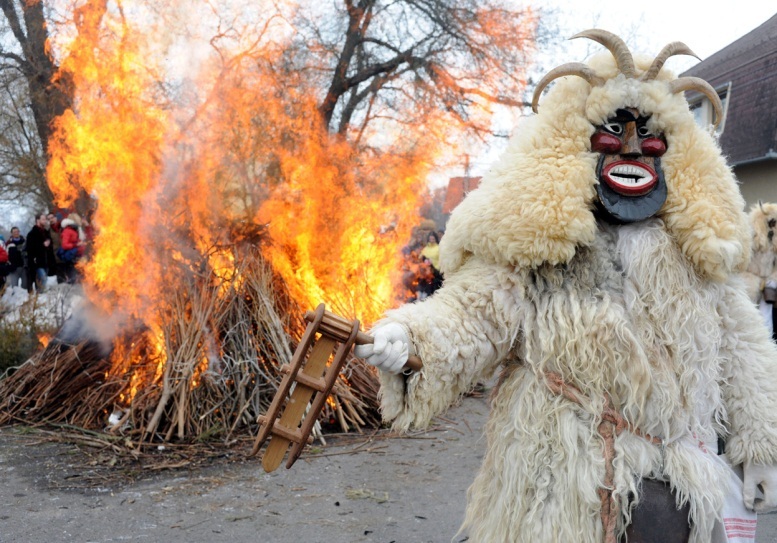 The carnival ends on Tuesday when a coffin containing a Busó costume is dragged through the village and burned at the main square symbolizing the "burning" of winter and welcoming the spring. The Town Hall (built 1924-1926) was planned by Aladár Árkay and his son, Bertalan. The Town Hall is a bulding in Hungarian style, ornated with Oriental motifs, crowned by corner- and tower domes. The enormous tapestry showing the legend of the Busó Carnival - designed by István Bán, handicraftsman of Mohács origin - in the aula of the Town Hall. Copyright 2016 Carnval. All rights reserved.